This filament guide printed nicely, however, the filament slips out through the split on my Prusa i3 MK3. I don’t see the purpose of the split, it’s just as easy to pull up the filament from the top. Printed correctly, does the job. Thanks! Printed the last week it in green PLA, first experiments, works great. For smoother operations i just slightly sanded the inside to have less resistance between the filament and the guide, works perfectly and fits great on the Anet structure. Model printed great but is about 1.8 mm too big for a Prusa i3 MK3. Too big for mk2s aswell. Stupid me. I just fit some folded paper between the guide and the MK3's frame. Seems to work well. wow looks very very nice and its exactly that thing what i need and want- but it does not fit on my anet a8 cause i have an extra frame behind the LCD frame... could you make one with 1,5cm frame size (so i mean 1,5cm between the legs)? It fits very good! Thank you! Nice to hear that, thank you! Thank you for sharing. It fits perfectly. I'm glad you find it useful. Thank you for your comment! Thank you for this post. It really helps having the filament secured and not all over the place. This fits really well for A8 printer. If anyone has the newer model of Anet A8 , i remixed this filament holder (v2) for it. top frame of 7mm width. Hey , it's never late :) Enjoy your printer mate. this is one of my first prints and i have to say, i dont really know how to set the printer correctly. I use Cura. There is no such thing as "Rafts". When it talks about "Infill", the corresponding setting in Cura is "Infill Density"
What is the corresponding value for "Resolution" in Cura? Sorry for the stupid questions :). Yes. Or rather Fill Density. printed with Prusa 3i by AnyCube w/o modification and 0.1 layer. Very good and fit perfectly on my printer frame. Tks a lot for sharing the object. @subscot we found out that some printers have a thinner frame compared to the original Anet A8 so you need a bit of tape to fix that. Fit was a bit loose but followed the advice of other users and added two layers of blue tape and now it is very snug. Thank you! I can download all files without issues. maybe thingiverse has an issue with it's CDN. I tried the single files, but I can download the entire zip archive from the link you posted. Looks great, chunky and functional, printed without any problem, works perfectly. Great design. The print came out perfect. Quick question. Do you just set it on top or do you glue/fasten it to the frame somehow. My extruder keeps pulling it to the curve on the right. Update: I added a layer or two of blue tape to the inside to help grip and it is now an unmovable object. lol. The tape trick works great! Thanks! Mine simply fit on top. Newer A8 probably has a thinner acrilyc frame so maybe you could place a bit of tape on the inner side to make it fit. I can attest to the Newer ANET A8 being off ever so slightly in thickness. (Were talking about a few mm here). So this doesn't fit perfectly on the top of the Printer. But you can add a little bit of tape to the back side and get a really good grip. It doesn't all in all this is a very good addition to my printer. Thank You! Thanks for this information: so the newer Anet A8 has thinner frames. Using some tape is a good tip, or if you haven't printed it yet, you can scale it down some % to get a perfect fit. My issue I had a raft on I have not had a chance to clean it off. I may try again to clean it up some. As you can see, it tends to pull the filament to the outside (forward position) of the circle - right where the gap is. I have been using this, and I enjoy it. However, the filament actually gets stuck during prints in the opening. Do you have a version without the opening at all? Yes it can! I used Tinkercad to remix the original thing, but then converted to .step to allow others to modify them! Just put a piece of paper folded in 3 between the guide and the frame. That way you won't scratch your frame. I did it and it works pretty well. Another idea is to put some small rubber foot/bumper inside so that it will stick. Well, if you are the only one to complain, probably the distance is correct and you are using it in the wrong way, or your printer is not set properly. Seeing your make, you use it on the top horizontal frame that is thinner than the vertical frame. The original Anet A8 has different thickness between vertical and horizontal top frame. The top frame is thinner so and the filament guide won't stay on that. Your printer is probably a different version, or a newer A8 with different parts! Ok, lets check. What is the desired distance in your model? I have 7.7 mm thickness for horizontal plate and 7.6 mm for vertical. I doubt whether they can be different due to the fact they were made from the single acrylic piece. The thicker acrylic is used for Z-motors side supports. And what are yours dimensions? As you can see, I only remixed this thing from an existing one. I moved the ring from vertical to horizontal without doing any measuring. Mine fits tightly on vertical frame and will slip and come off on the top horizontal frame. I don't have my printer at hand now so I can't take the thickness. None of the 27 "made" before yours complaint about this, so my idea is that your printer is different or your print comes out with different size. However you can simply print it scaling down a bit, like 95\90\85%, and voilà it will fit. Say thanks by giving papinist a tip and help them continue to share amazing Things with the Thingiverse community. 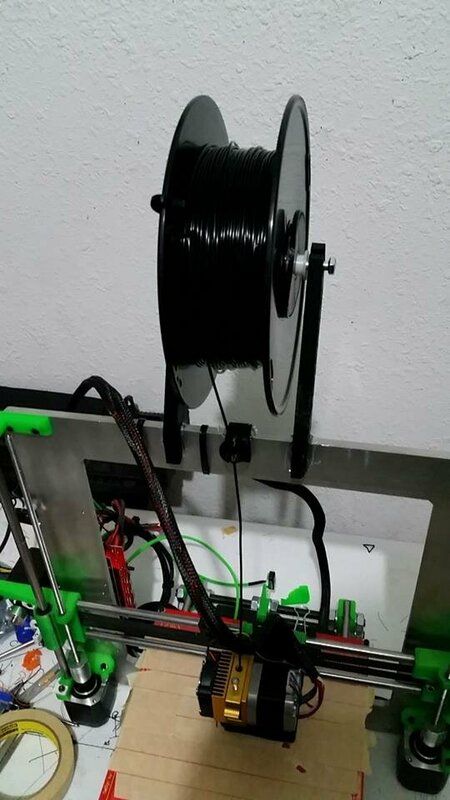 Anet A8 Prusa i3 Simple filament guide (Horizontal) by papinist is licensed under the Creative Commons - Attribution license. Say thanks and help papinist continue to share amazing Things with the Thingiverse community. You'll need a PayPal account to tip papinist. Click the button below and you will be redirected to PayPal. Once the payment is complete, you'll be brought back to Thingiverse.